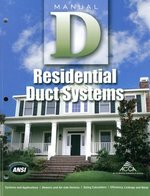 The ANSI-recognized national standard for residential HVAC duct design will help you design a duct system in less time. The popular and accurate procedure has been revised to include updated and expanded VAV guidance, with detailed examples; impacts of excess length, sag and compression in flexible ducts; and new equivalent length values for flex duct junction boxes. Manual D, from the Air Conditioning Contractors of America (ACCA), provides a single set of ANSI-recognized duct sizing principles and calculations that apply to all duct materials.